Below is a ‘new to me’ very large blast cabinet I picked up a month ago. It was sitting, unused for many years, in another hangar on our airport. It came from a friend, a thank you for sharing the fundamentals of personal defense with his daughter, for whom he had purchased a S&W Airweight. A shop tool someone had paid $3k for in the 1970s or 80s, swapped for a rewarding afternoon at my backyard range, showing a petite woman in her 50’s how the word ‘No’ is a command, not a pleading request, when you have the right tool in your hand. Above, the cabinet and the separator are products of Zero Mfg. Once the finest brand of abrasive blasting, great products made in Missouri, today a relic, a victim of a very clever bankruptcy engineered by bean counters who thought nothing of the manufacturing jobs they threw away. It is 40″ x 36″ x 30″, the whole front opens, the round discs are counterweights on the door. Over many years at the airport, this cabinet had several owners, but none of them found it to work very well, and it eventually fell into disuse. This made little sense to me, as this was an industrial tool, it should have worked better. All the hoses and wiring were rotted from sitting, and I carefully replaced all of it. When going through the air lines to the foot pedal, I found the culprit. Some time, many years ago, someone had put an adaptor fitting in the air line with a restrictive internal diameter, about 1/8″. I replaced all the air lines with 1/2″, and made sure the smallest restriction in the line was 3/8″. The nozzle in the BNP gun is 3/16″, the smallest orifice, as it should be. Set up this way the cabinet is now doing an incredible rate of work. Its performance was a tiny fraction of this for decades, all due to a single fitting that’s carelessly installed by someone now long gone. Over the years, I have seen a dozen Corvairs where the owner was plagued by some issue, poor performance, overheating, rough running. Most of these people went to the internet to ask for feedback, and were provided with an endless array of highly improbable reasons, and equally arcane ‘solutions’. Just like the restrictive fitting in the air line, the answer was always simple; just ask what is different from other installations that are nearly identical, but have long proven to work, there lies the answer. It is almost always something ‘custom’ the builder included, often at the suggestion of a local expert or a mystery person on the net. When I show this to people, something as simple as never having opened the nose bowl inlets on their plane, they express some disbelief, later a little thanks, but I’m yet to see one go back on the internet and tell everyone the solution was something simple, and just making it as I suggested in the first place. 3.0L Corvair for Zenith 601XLB, Steve Mason. Two weeks ago, Steve Mason made a family trip down to Florida from upstate NY. He brought his Corvair down, so we could run it on my test stand. Its a few casual hours of prep and inspection it was ready to break in. I turned over twice in a second or two, lit right off, and ran flawlessly. Above, Steve give his best “Captain Morgan” pose, something of a social requirement on public Corvair test runs. This picture was taken right in front of my house, looking north up the runway. Above is a 14 second engine run Video. Just a little look at a 30 minute test run. In the first 1/2 hour the primary thing we are after is breaking in the cam correctly. This is done by having ZDDP added to the oil (this comes with my cam kits) and running the motor at 1,800-2,000 rpm. Above, a bit classier picture of Steve. He built the engine from an SPA “engine in a box” kit. These kits come with every single piece needed to build and run a Corvair flight engine, including every engine part from my catalog of Corvair parts, plus all the appropriate ones from the SPA Corvair catalog. If you would like more info on price and availability on EIB Corvair kits, call SPA at 904-626-7777. PS: I have builders at my house, but only by prior arrangement. Once every few months someone tries to stop by uninvited. I take a dim view of this, just the way you would if anyone invited themselves over to you residence. I live in a private residential airpark, and the neighbors are pretty cool about me having guests over and running engines for extended periods, but the are not too keen on uninvited people driving through the airpark in circles looking for my house. I have people over for one on one training, to fabricate special parts or for test runs, but these are all done by prior arrangement, and they are regular work, so they do have labor charges. Anyone inclined to stop by and talk airplanes should just come and find me after hours at Oshkosh. Thanks in advance for being understanding. Here is a piece of shop equipment that isn’t very expensive, but I have used for more than 15 years as very useful tool. You may not have one, or even an air compressor, but if your friend does, you can purchase some materials and get the same results. The basic set up is a pneumatic paint shaker, for one gallon cans, just like the one local paint stores use. You can buy new, empty one gallon cans, put steel parts like rocker arms, guide plates and various bits of hardware in the can, add ceramic media and a quart of simple green, and shake it for 20 minutes. It does a great job of both cleaning and polishing. You open the can and pluck the parts out with a magnet, wash them off with water, and they are ready for inspection. The best part is you can drink coffee and watch the shaker, and still feel like you are getting work done. This close up shows “Triangular ceramic finishing media” You can get 5 pounds from the worlds greatest shop catalog, McMasterCarr.com. It’s part number 4918A181, and it only costs $20. Theoretically you can wear it out, but the media pictured is actually 19 years old, so its not really a consumable item. Above, a regular pneumatic paint shaker. They don’t consume much air, you can run one off a fairly small compressor. This arrangement does a very good job on small parts, and leaves them with a much better finish than other methods. If you don’t have one, just clean the stuff up by hand, but if you have a buddy with a shaker, its a pretty useful arrangement. We are less than a week from the Deland FL Sport Aviation Expo, and less than two weeks from Corvair College #43 in Barnwell SC, last event of the 2018 season. (Sign up closed last Monday, it was open since June 3rd) Although the public events are winding down, there are still 77 days left in 2018, and there is plenty of building still to accomplish. I spend some time out in my hangar or shop nearly every day. Like everyone else, I have productive days and some not so much. I have days of long productive runs of traditional parts, and other days were I spend the hours working on some R&D, running a builders engine, or just repairing tools, cleaning and organizing. If you are a new builder, and have periods where you have to seek motivation, don’t take it as a sign you weren’t meant for homebuilding. Just like anyone else, experienced or not, we all need someone to recharge our batteries. Shop stories of building provide this for me, and over the next 77 days I’m going to shoot to put out an average of a short story a day on this, just to keep everyone productive through the end of the year. I have a lot of material to publish here. I have a lot of stuff still from Oshkosh 2018, and there will be plenty of stories from CC #43. In with these are regular updates that come in from builders, shop notes, tech stories, and an occasional ‘thought for the day’. I encourage builders to use the comment section for thoughts and questions. Keep in mind that the Comments section on the “Corvair College” Facebook page (its open to the public, you don’t have to have a FB account to read it.) has a lot more activity on it than the blog does. The Corvair College FB page carries all of these stories, but it also has occasional input from other builders or the Moderator Shelley Tumino. Check it out if you like. Corvair College #43 Sign up closes Monday October 22, 9pm EST. If you are planning on attending CC #43 in Barnwell SC, this is last call. We have slots left, but they may go before Monday. Either way, the cut off is Monday night at 9pm. Above, Photo from Corvair College #31 at Barnwell. 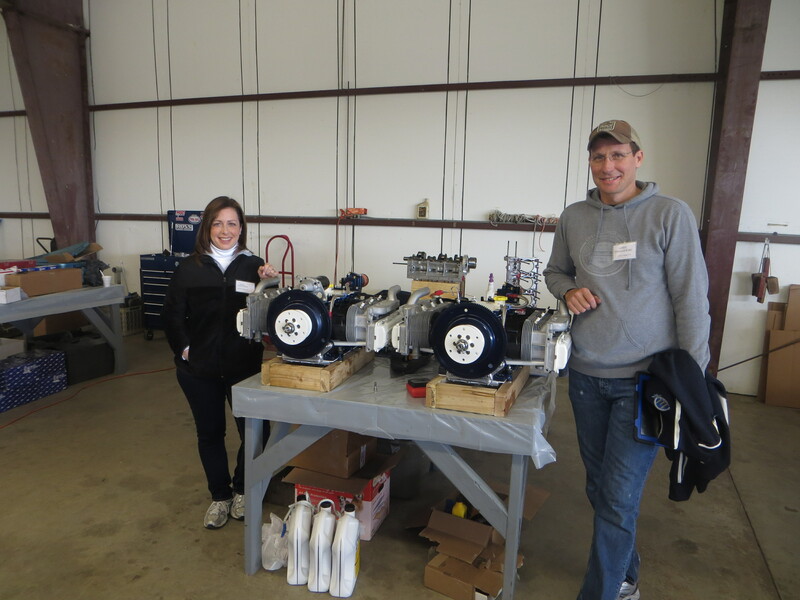 Rob and Melissa Lutz getting started on their 3000 cc engine for their Zenith 750. 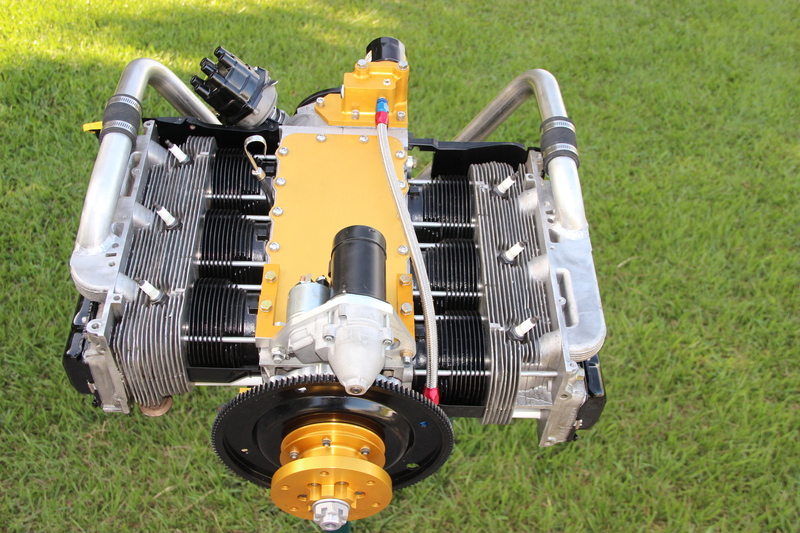 Today this engine powers their completed aircraft. Above, Jim and Ginger with the engines they built and ran at Barnwell Corvair College #31. Today, these engines are flying on their twin. Read the engine story here:12 Cylinders / 6.0L of Corvair Power for JAG-2 run at CC#31 and read about the plane here: JAG-2 Corvair powered twin; Now Airborne..
How do dreams come true? What is the common thread? You go to a positive setting run by good people willing to teach you what you need to know. This is what Corvair College is all about. Over the years, more than 1,500 people have attended one of my Colleges. I figure about 50,000 people almost signed up for one. Guess which group was more likely to finish and fly their airplane. Your time, your life, your choice. Corvair College #43, One Month Away. 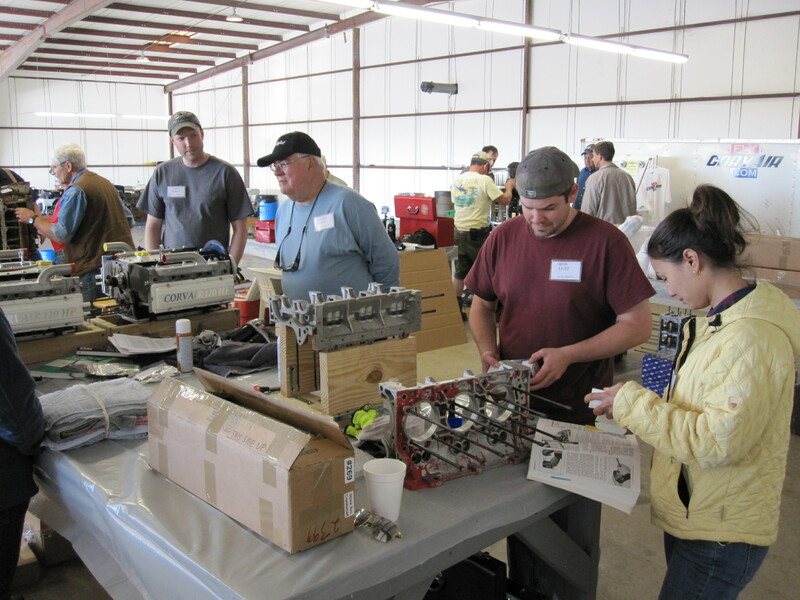 We are now one month away from Corvair College #43, November 9-11 in South Carolina, The link below includes all the background information, and the sign up link, and a historic look at the achievements of previous Colleges. There are still 18 of 90 spots available, the sign up will close shortly. If the above rule were not true, The Marine Corps could close Parris Island and Camp Pendelton, and let the Milenials working for Google and FaceBook design its small arms. In all venues that matter, the simplest machines, in the hands of skilled, trained operators, will always prove to be the most reliable tools. This has been true since the Bronze Age, and only a salesman would argue otherwise. If you sign up and attend this Corvair College, you will see our commitment to applying the Golden Rule to homebuilding. Experimental Aviation is a venue that matters, and you should select your path in it, guided by a philosophy of reason, not one of marketing. Postscript thought: The #43 info page link above has been up for more than 110 days. Going to this blog at anytime and typing “Corvair College” into the search block on the upper right would have directly taken anyone to the #43 info page. I understand that I have a lot of stories on this page, but they are not excessively difficult to find with a modest effort.